The Cornish summers are anything but predictable. One day I’m sweltering in shorts and beach shoes and the next I’m shivering in waders and a thick jumper. Although the showers are back with a vengeance, there’s always something to be found if I can make it across the rocks without breaking an ankle. 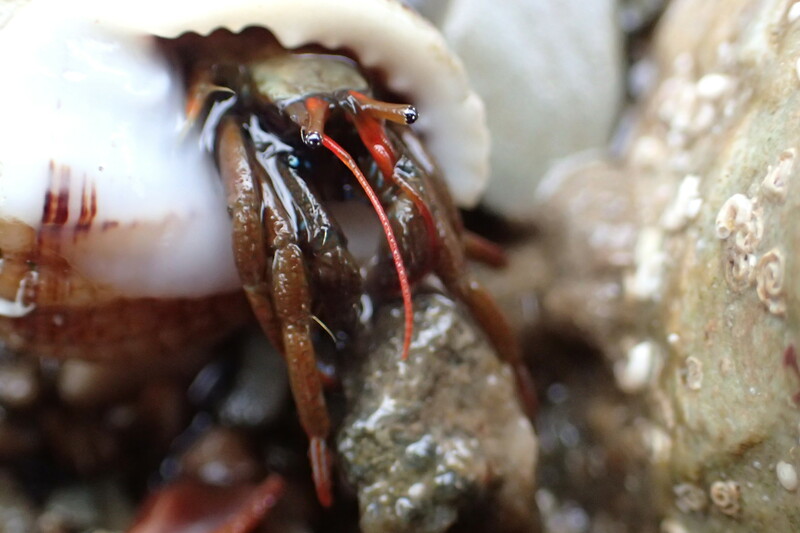 My first outing is to the rocks beyond East Looe beach and I’m pleased to come across a new colony of St Piran’s hermit crabs on the mid-shore. 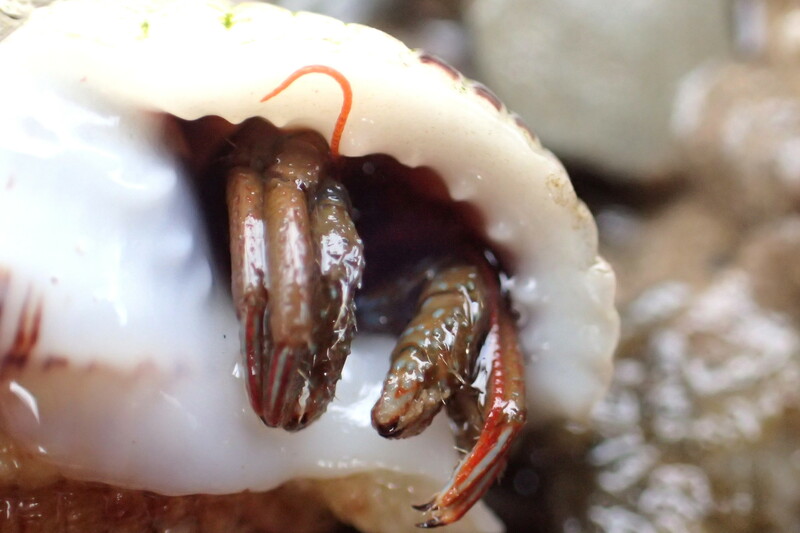 A St Piran’s hermit crab starting to emerge from its shell. They’re becoming a familiar sight around Cornwall and I’m starting to recognise them from the tips of their red legs, before their chequerboard eyes and equal-sized claws emerge from their shells. 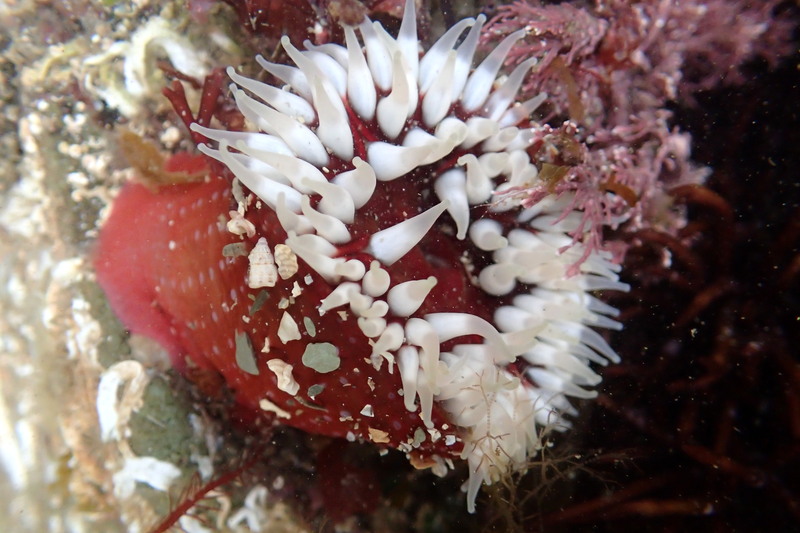 This hairy crab is also out and about enjoying the showers. 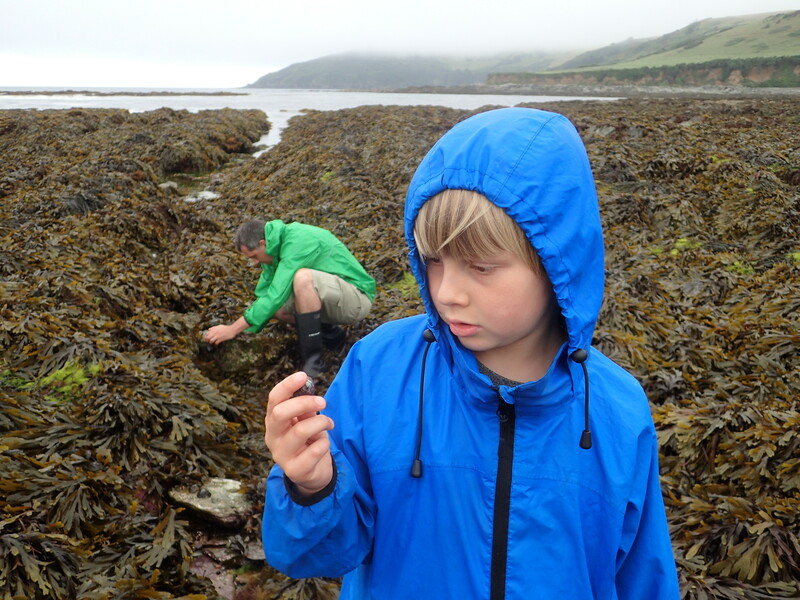 Dragging the family with me on my next expedition, I take a look at the other side of Looe. 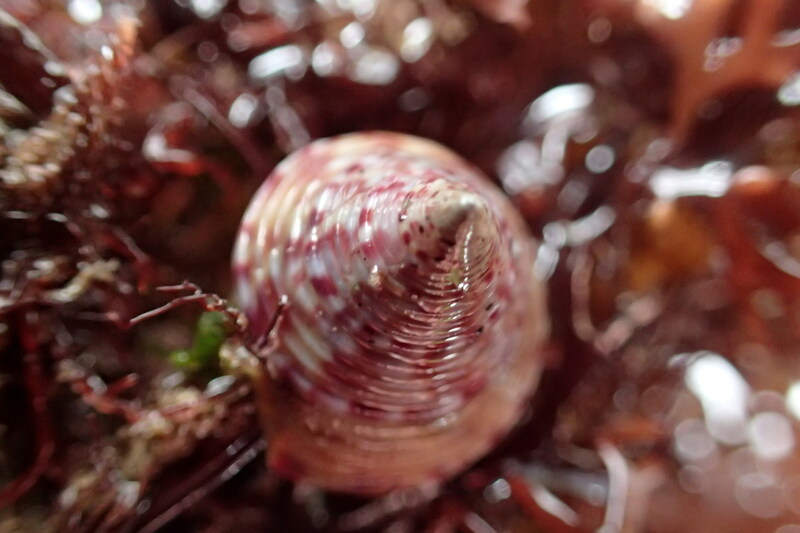 At Hannafore, the rocks are hidden under a thick brown tangle of wracks, sargassum weed, and kelp making my feet slither with every step. It’s hard to make out where the pools are much of the time, let alone what’s in them. Still, with some patience and careful sweeping aside of the long strands of weed, some treasures are revealed. 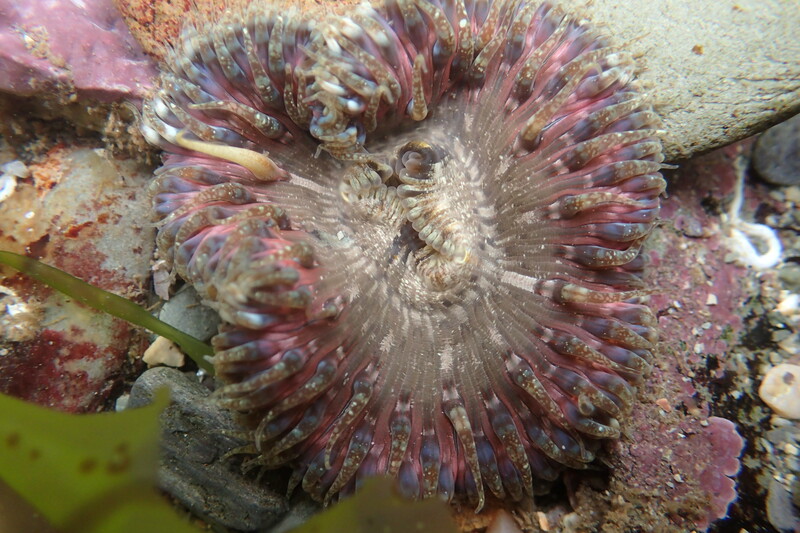 This heart-shaped daisy anemone is the pinkest one I’ve ever seen. As we wade in a long, deep pool a large fish passes between the fronds of sargassum near my feet. Moving slowly, I herd it towards a shallow corner, and, holding a bucket behind it take one more step. Nine times out of ten, I fail and the fish darts away never to be seen again. This time, the colourful fish takes me by surprise and swims straight into the bucket. Here it is – is the first adult corkwing wrasse I’ve found in a rock pool. Cornish Rock Pools junior comes over to admire the fish, talks to it and gives it a stroke. 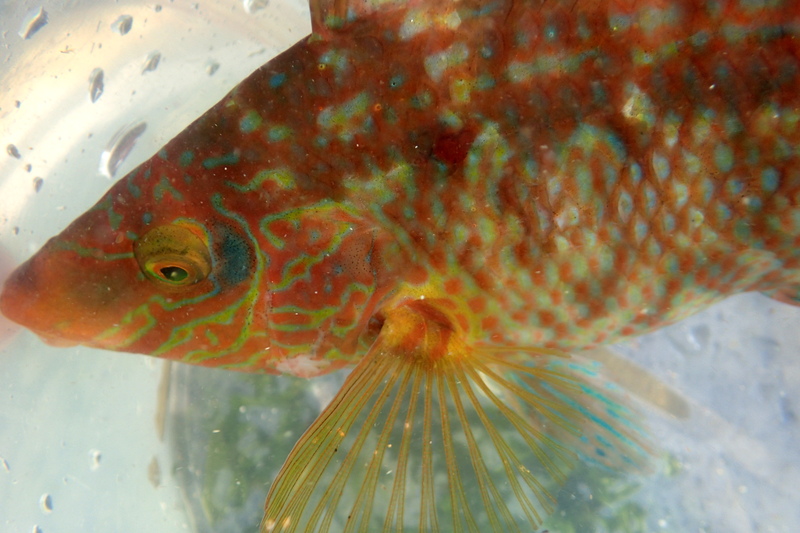 We look at its pouting lips and the iridescent blue stripes on its cheek, the typical colouring of the male corkwing wrasse. The female is much more dowdy. 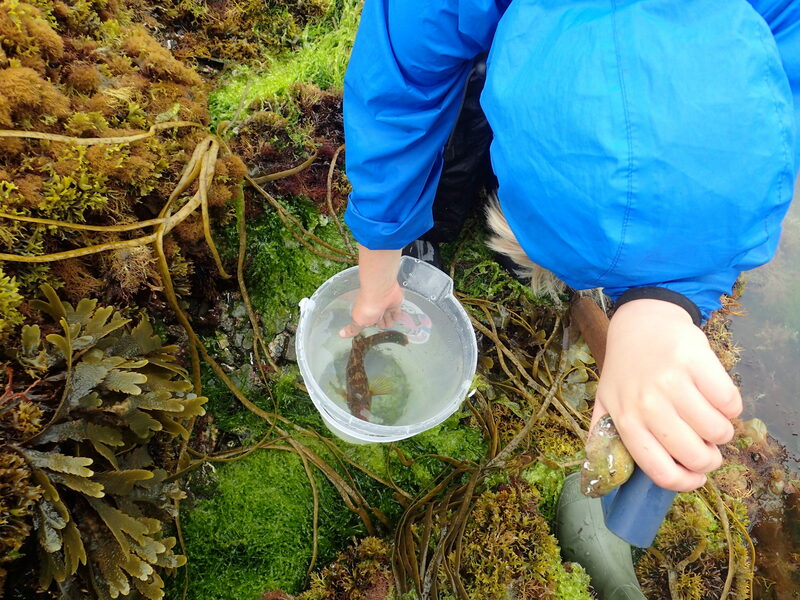 After a few minutes, Junior lowers the bucket into the drizzle-spattered pool and we watch the wrasse swim free among the weeds. 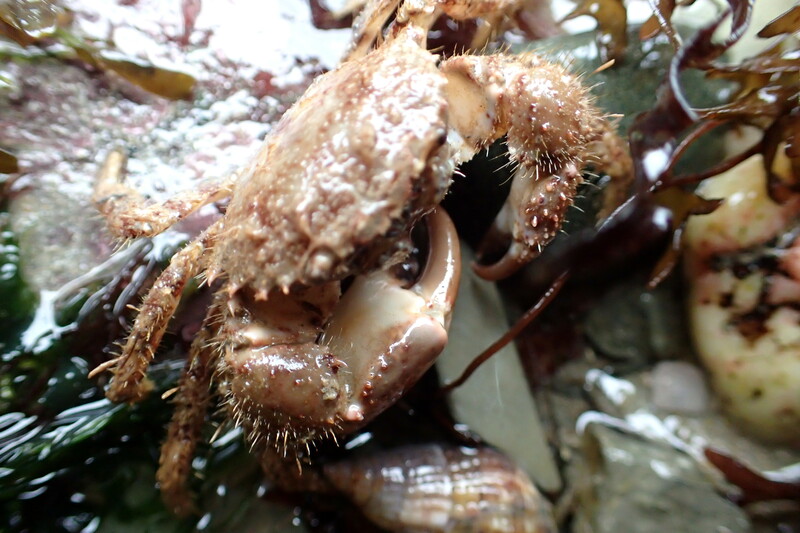 I can see why most people see rockpooling as a fair-weather activity, but I’ve always liked the heavy calm of an empty beach on a foggy, damp day, and the animals are as colourful as ever.